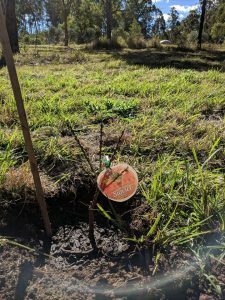 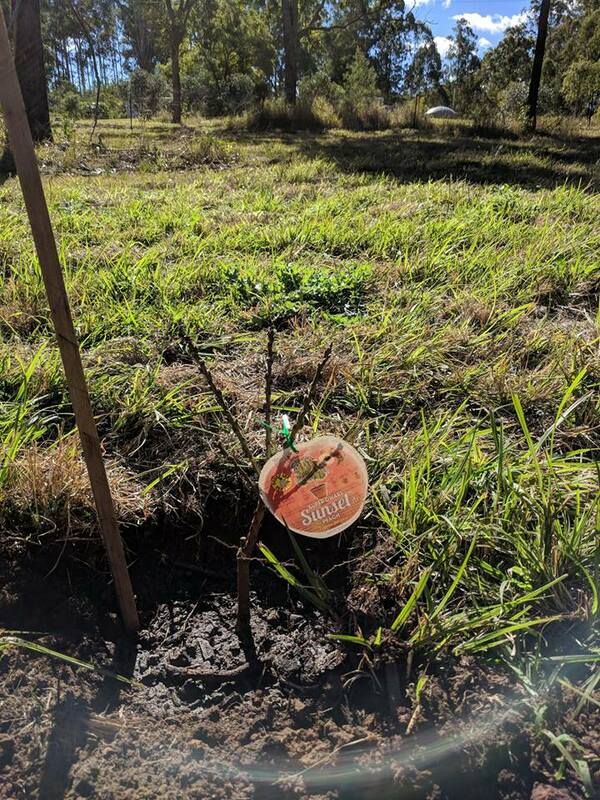 So our day consisted of marking out the new Pomes&Stones Orchard to the east of the Citrus Orchard, and planting the bare-rooted dwarf apples (3x green ‘leprecaun’ (the 4th arrived today, so it’ll be planted out on Friday) and 2x pink ‘pinkabelle’ for cross-pollination), dwarf apricots (3x ‘fireball’), and the dwarf ‘sunset’ peach and nectarine pair, then transplanting the 3x pears, 3x plums, 2x peaches and 1x nectarine (all standard size) from the area to the south of the Citrus Orchard because the soil there wasn’t very good, and their new spot is SO much better. 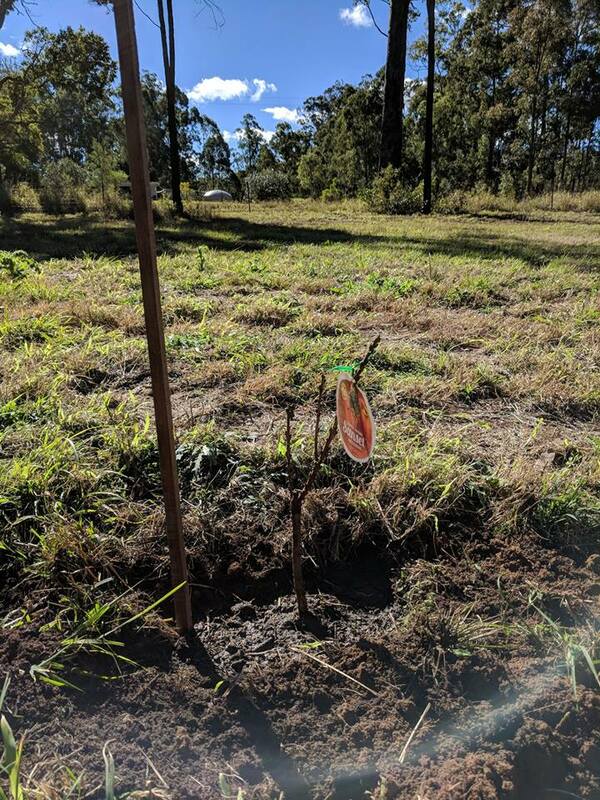 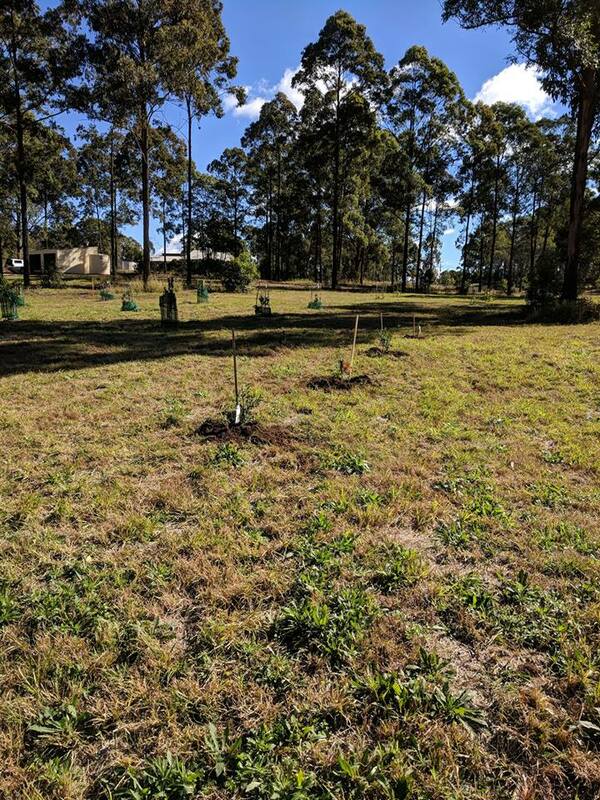 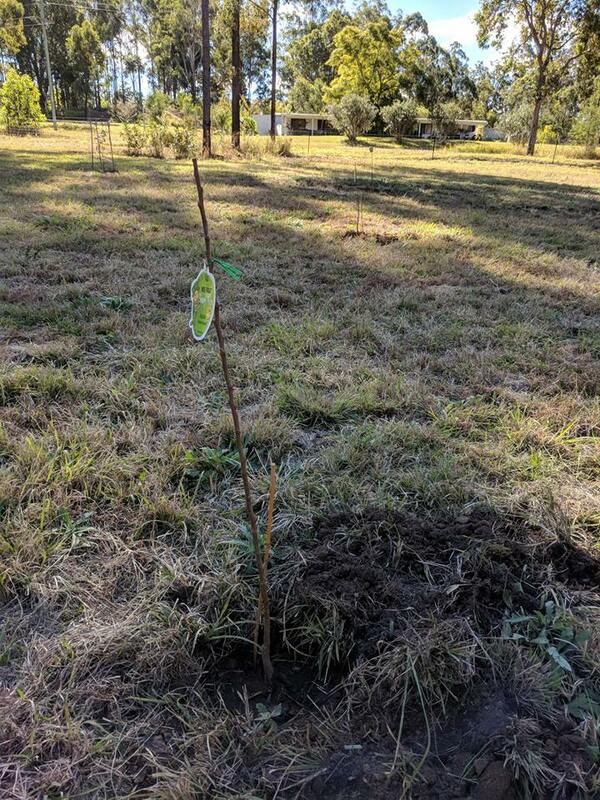 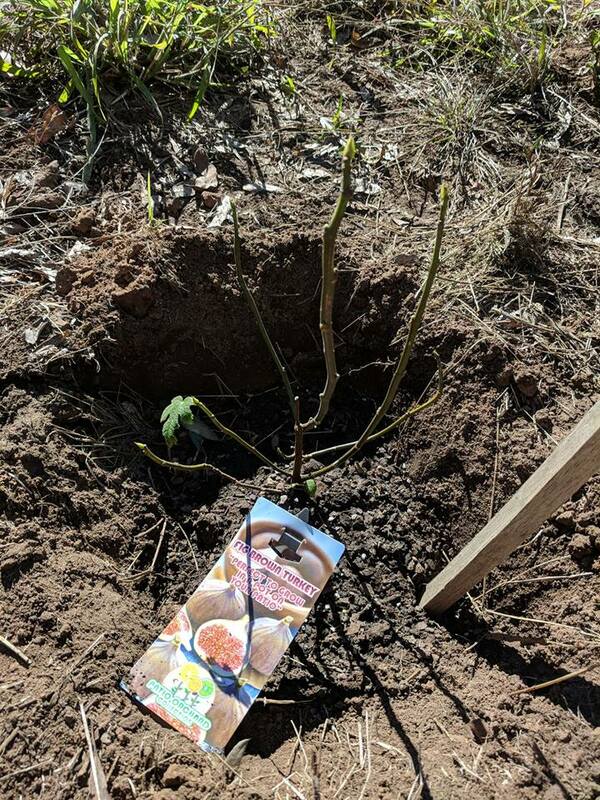 The 4x finger lime hybrids were planted out on the northside of the Citrus Orchard. 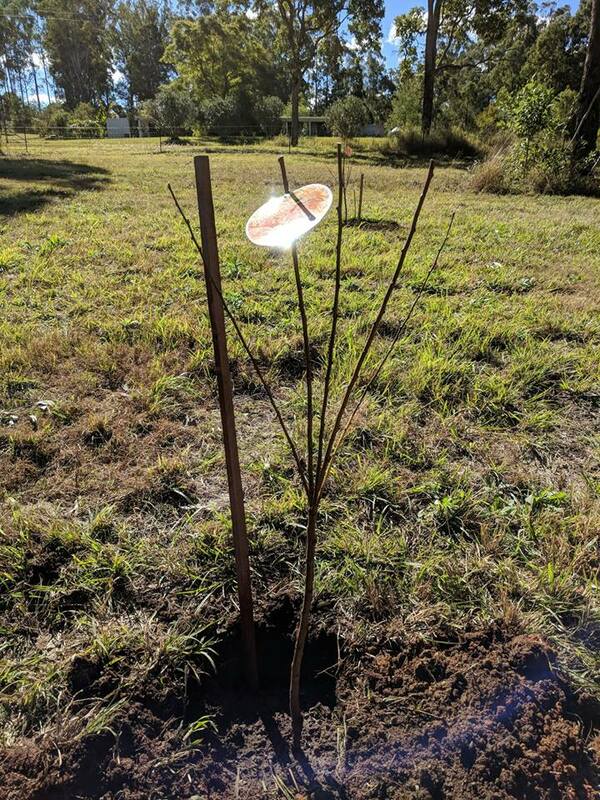 I decided to try them in full sun (or mostly, with the shadow of one gum moving across them during the day) to see if they produce more fruit than the one down by the (ephemeral) creek, which is mostly dappled sun. 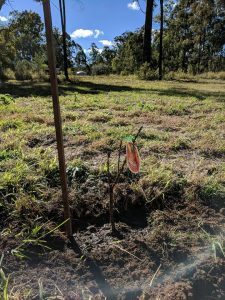 Then we added another ‘black genoa’ fig to the line up near the shed, but decided to put the 3x ‘brown turkey’ figs down near the avocados’ new spot (the ‘reed’s have always struggled with the soil where they are, too, so we’d decided to reallign the avos as well) because even after the good amount of rain this week, the soil was still rock hard up there – not a good sign. 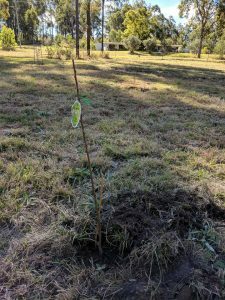 So, the ‘fuerte’ avo got moved to between the two ‘hass’ (rather than behind the dwarf ‘hass’), making a diagonal, slightly zigzag line n-e to s-w. A fig was then planted on the western side of each of them to provide afternoon shade in summer. 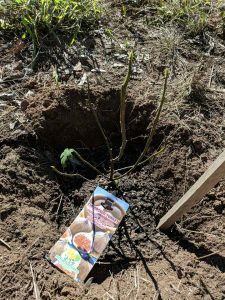 The ‘reeds’ were then moved to be in line with the others and a row of quicker-growing arrowroot was planted along their western sides to provide them with shade this summer, rather than in a few years when the figs grow big enough. 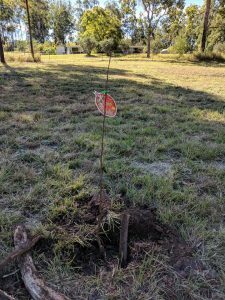 Then a few pineapple heads were planted under a tree near the shed. 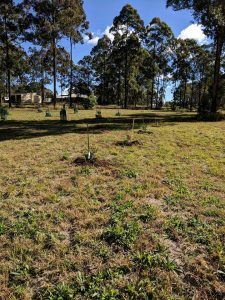 Everything planted got several generous handfuls of home-made compost mixed into the soil around them, and all the transplants received half a can of seaweed solution to help them with any transplant shock (although they should be mostly dormant at the moment anyway). 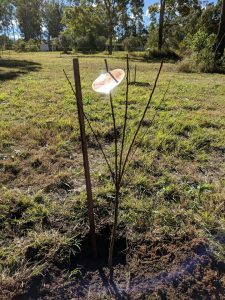 So take-home message: experiment with different positions and never be afraid to adjust and/or move a tree if it seems to be struggling; fruit trees are a long-term investment and you want them to be in the best possible conditions to give you the best harvest.